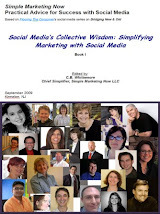 Simple Marketing Blog: Bathroom Blogfest Social Media Marketing Analysis: Why Participate? Bathroom Blogfest Social Media Marketing Analysis: Why Participate? Don't forget that there's a historic quality, too.The event just completed its 5th year! I like participating in the Bathroom Blogfest because it inevitably brings intense social media marketing learning. I consider a blog critical for generating content. It's your marketing & communications hub. An important aspect of a successful blog, though, is connecting and engaging beyond your site to become part of a digital community - something that's easy to lose track of as you focus intensely on creating content consistently and meeting deadlines... The Bathroom Blogfest represents a friendly means for exploring other sites and connecting. I have formed lasting relationships as a result. Social media marketing involves experimentation to figure out how to make sense of new tools available. Twitter had no place in the first Bathroom Blogfest; it does now. The intensity of the Bathroom Blogfest experience makes for valuable pressure-testing! Blogposts, tweets, Facebook updates and comments need to be tracked and coordinated and some systems work better than others, particularly with increased complexity. Perhaps we'll add a Twitter Chat next! Bathroom Blogfest uncovers brilliance and cleverness; it's a bridge to perspectives otherwise foreign to you. It stretches your awareness and intellect and fires up your creativity. Finally, Bathroom Blogfest has dimension! It takes place offline as well as online. Don't believe me? Try it. Bring it up in conversation with friends, family and business associates. I guarantee it will generate stories, anecdotes, and leads to followup on. The Bathroom Blogfest has become a meme of sorts, evolving since the first event in 2006. What started out in 2006 with 9 bloggers has grown into a much larger event and fascinating Bathroom Blogfest Community [aka BBC] with close to 40 bloggers participating in 2010. We added BathroomBlogfest.com in 2007 to create a central focus point for the blogfest. It has evolved, too, over the years. Since 2008, we've adopted a distinct theme for the yearly Bathroom Blogfest thereby adding an element of surprise. 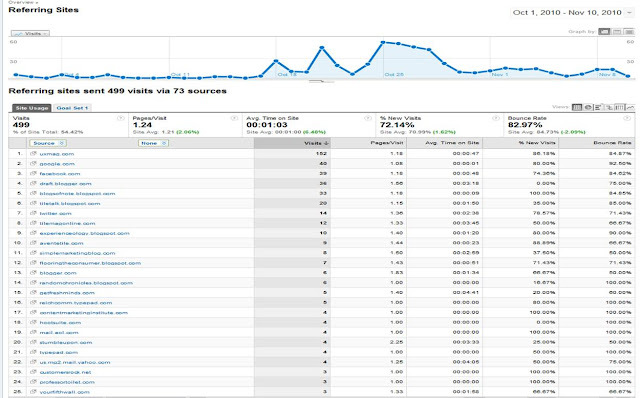 To give you a sense of the growth in the Bathroom Blogfest, I thought I would share with you a few charts. Here you see the increase in traffic to BathroomBlogfest.com from 2009 to 2010. Yes, this is definitely a yearly event with little activity in between. This next chart details referring sites. Notice that Facebook and Twitter represent important sources. Interestingly, the Twitter traffic spent more time on the Bathroom Blogfest site compared to the Facebook traffic. I wonder how much stronger the Facebook traffic would be if we were to start re-connecting with Facebook fans a month or so ahead of the Bathroom Blogfest to build up event momentum. This next chart captures the volume of conversations that Bathroom Blogfest 2010 generated between May 8 through November 8, 2010 [using eCairn Conversation]: close to 400 conversations consisting of Tweets, Facebook updates and approximately 70 blogposts. The Bathroom Blogfest continues to evolve and I invite you to participate in next year's event, as an active participant or a supporter. In the meantime, I hope you will look at the bathroom experiences around you with fresh eyes and consider how you might improve your patient, user, customer experience. Oh, and go visit the sites of my fellow Bathroom Blogfest participants. You may want to subscribe to several of them. What other learnings would you add? Bathroom Blogfest 2007 posts: available via this link, this link (2), and this link (3), and finally this link (4). Theme: Cleaning Up Forgotten Spaces Around Us. Theme: Flush the Recession and Plunge Into Forgotten Spaces. Theme: Inspired by Mad Men - Stuck in the 60s? What an excellent recap CB. And nice demonstration of how one can actually use social media tracking. I think the unspoken here, is that to really create something that has conversational legs, you also have to get "out there". The theme had to be a little bit weird and crazy to work. You seem to have identified a trend in usage that blogs are not as salient as they used to be outside other forms of social media. Interested in hearing more of your thoughts on that. Love how you describe the magic of the theme: a little weird and crazy, but also something that everyone can relate to. About blogs. I believe that they are as salient and valuable as ever – if not more, especially for creating a long term presence. They are workhorses for building content and developing thought leadership and remain important Google magnets. As it relates to Bathroom Blogfest, in terms of creating buzz for a 1 week event, the other social tools really matter – especially Twitter. Some of the Twitter interaction is almost like a relay race like with the creation of tweets, the RT and the opportunity to propagate the message across different follower networks. Lots of interesting influences to digest. Who would have thought that your experiment 5 years ago would yield so much food for thought!